More stuff I ate! We'll start with this amazing cupcake from Muddy's Bake Shop. Saturday was National Cupcake Day according to my Gone for a Run day calendar, so I had to treat myself to one. I stopped by Muddy's and grabbed this Vegan Cookies & Cream Cupcake, which I shared with Paul. That same calendar also told me that last Thursday was National Margarita Day, so I picked up some tequila, Memphis-made Crazy Rita mixer (it's made with real sugar and no HFCS), and Crazy Rita Pink Salt (for the rims) on my way to my friend Shara's house for girl's night. Our friend Becca decorated some margarita glasses, and we each enjoyed a couple drinks while we watched episodes of American Horror Story. Here's a plate of leftover Sausage & Cannellini Bean Jambalaya (from Fat Tuesday) and steamed Sweet Potatoes. And here's a lunch from earlier this week — Amy's Gluten-free Bean & Rice Burrito topped with Beer Chili and Daiya. Plus, chips for dipping. 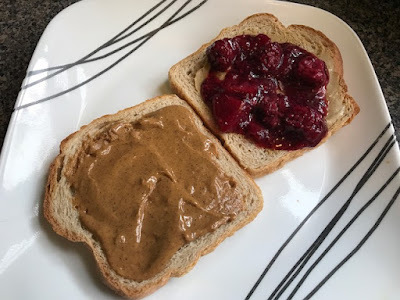 My current favorite pre-yoga or pre-workout snack — Whole Wheat Toast with Nut Butter & Jam. And finally, here's my dinner from Saturday night. Paul, Shara, and I had dinner at Crazy Noodle. I veered away from my usual order of Vegetable Ramen or Mandu Guk and opted for the Vegetarian Crazy Noodle, their signature noodle bowl. Rice noodles, tofu, shiitakes, veggie broth. Delicious and perfect for a rainy, lazy night. I've got lots of random food pics (and nothing else good to post on yet), so I'm breaking these up into THREE parts for the rest of the week! But before I share the stuff I've been eating, I want to mention a local event that I'm excited about. On Friday, March 2 at 6 pm, Vintage901 will host their Grand Tasting wine event at Crosstown Concourse (where I work). Tickets are $65, and guests can taste 70-plus wines as well as food selections from local restaurants (and a couple are vegan/vegetarian! Mama Gaia and I Love Juice Bar will be there). I'm going! And I wanted to post the ticket link in case anyone local is interested. It's gonna be fun! Okay onto the food! 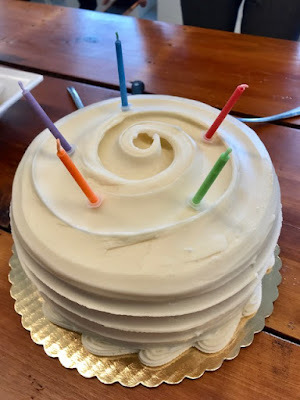 My office has monthly catered staff meetings, which give us a chance to get caught up with what everyone has been up to (and celebrate the birthdays for the month). We have a number of vegetarians and couple vegans, so there are always options. 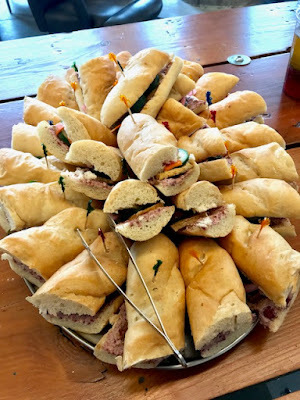 This month, they ordered a platter of Bianca Banh Mis (tofu banh mi sandwiches) from Midtown Crossing Grill. Look at all that Bianca! We also had a build your own salad bar with blood oranges and blackberries, as well as the usual salad toppings. One of those celebrating a February birthday was my co-worker Madelyn, who is also vegan. So we had THREE VEGAN DESSERTS! I made a sample platter with a few bites of each. All came from Muddy's Bake Shop, a vegan-friendly bakery. Of course, there was cake. This is the Vegan Capote Cake — chocolate cake, vanilla frosting. There were also Peanut Butter Bars, my very fave dessert from Muddy's! These have little crispy rice pieces mixed into the PB, and they're topped with chocolate ganache. Mmmmmm. 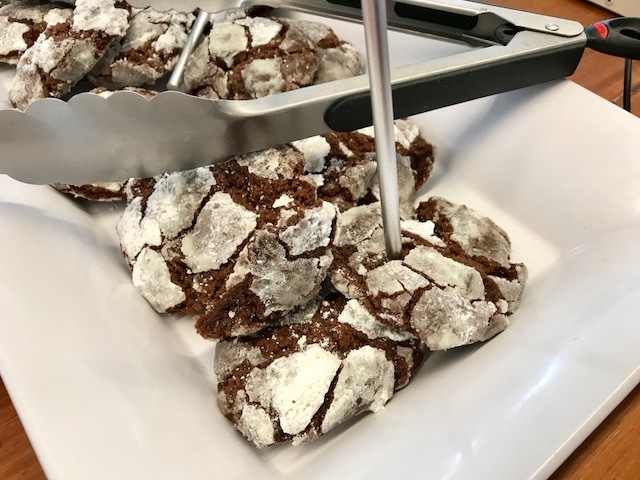 And finally, there were Chocolate Crinkle Cookies! These were new to me, and they were VERY good. Next time I stop into the bakery, I'll look for these! So moist and chocolatey. Okay, I'll be back tomorrow with some stuff I ate at home! 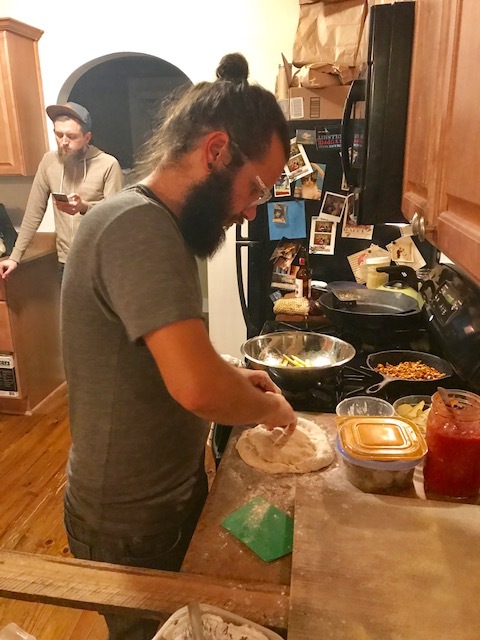 My friends Don and Kenzie (you've probably read about them on here in reference to Don's baking company, Lulu's Baked) host a weekly Sunday night pizza party called Pizza Cult. They invite over a few friends, who bring pizza toppings and whatever booze they're drinking. 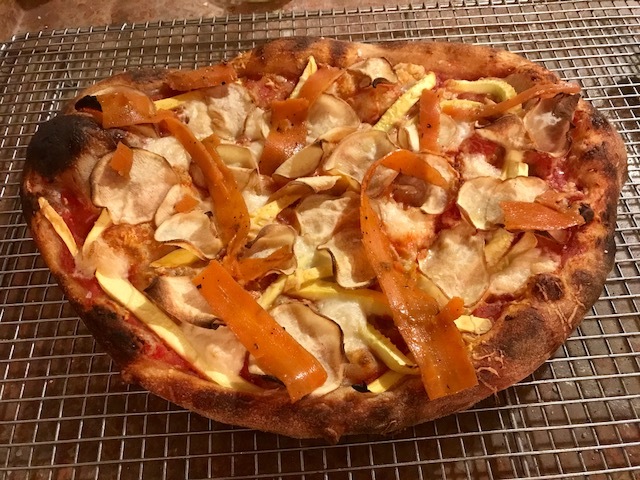 And then Don works his magic in the kitchen and turns out pizza after pizza, using everyone's toppings (and his hand-crafted cashew cheese) to create mind-blowing flavor combos. It's a pretty sweet deal for everyone who gets to eat! Plus, Don gets to play around with ideas for his next venture as a pizza chef at Fuel Cafe. This vegan-friendly cafe has hired Don to craft a pizza menu and sling pies. They're currently closed while they work out the technical stuff with the pizza oven, but when they re-open, Fuel will be selling Don's amazing pizza! Anyway, back to Pizza Cult. 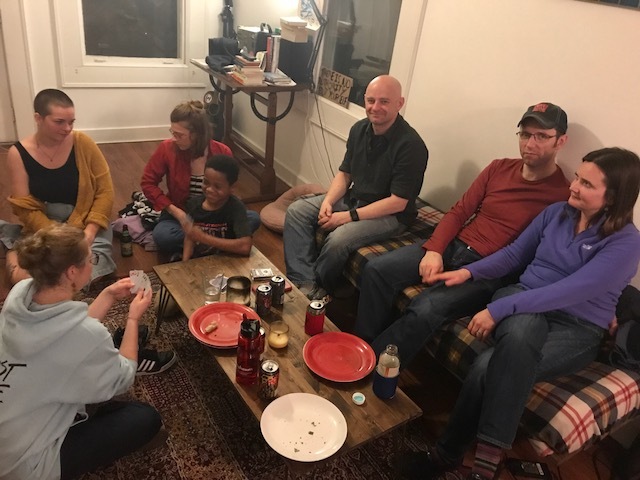 Don and Kenzie have been hosting this weekly party for months, and I keep meaning to go. But it's hard to get me out of the house on a Sunday night. 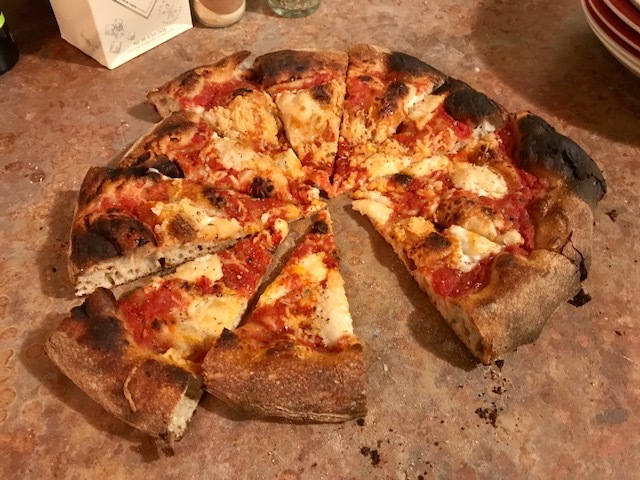 I finally made it to Pizza Cult last night though! And it everything was just amazing! First, Don put out a basic Cashew Cheese Pizza using the same cheese he's been selling at the farmer's market. It's a buffalo-style mozz, and it's so good. I picked some up last weekend and will be making pizza at home with it this week. That pizza was Paul's fave, but mine was this Italian Sausage and Potato Pizza. I brought the seitan Italian sausages (made using an Isa recipe for steamed sausages), and Jennifer and Simon brought the potatoes and white cheese sauce. 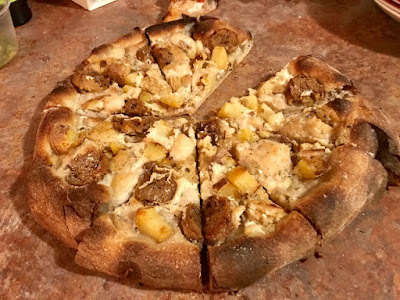 I LOVE a white cheese sauce pizza, and I LOVE potatoes on pizza. My third fave was the White Sweet Potato & Carrot Bacon. Don makes this carrot bacon every Saturday to stuff into his cashew cheddar and carrot bacon buns. It's so good. So, so good. This Blackeyed Pea Sausage & Mushroom Pizza was pretty fire too. I'm learning to like arugula on a pizza, but as I've mentioned before, it's my least fave green. It's so pretty though! It was actually really good here, contrasted with the mushroom sauce and blackeyed pea sausage crumbles. 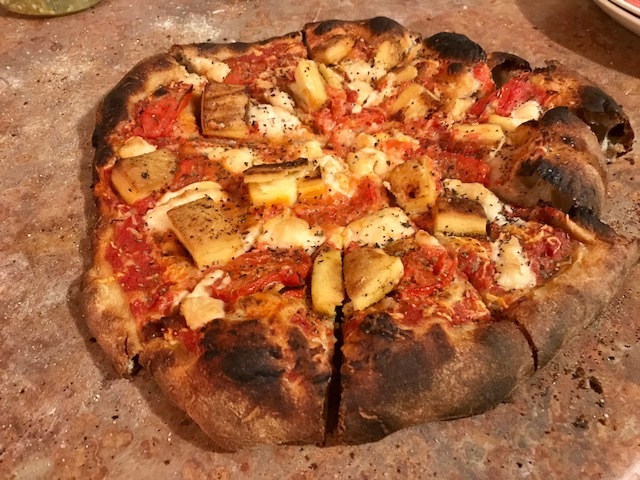 And finally, there was a Chickpea Tofu & Cashew Cheese Pizza that was delicious! I had this slice just as we were leaving, and I was super-full, but I had to try it. Love me some chickpea tofu! 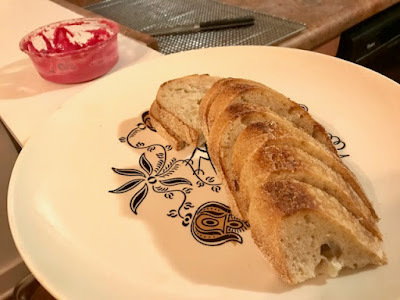 Don also had some Baguette with Beet Tahini Sauce out for snackin'. Very good! Here's Don doing his pizza thing in the kitchen. And here's Kenzie (bottom right) and friends in the kitchen. On the other side, their 9-year-old neighbor Tim played cards with Megan. As if pizza and friend time weren't enough, there was also lots of dog love! Here's Lulu, the sweetest little pup with the cutest little underbite. And Morty! 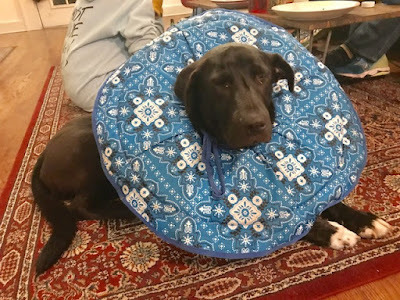 Morty is their new rescue, and he's already been attacked by the cats. So he has to wear this cone while his injured leg heals. 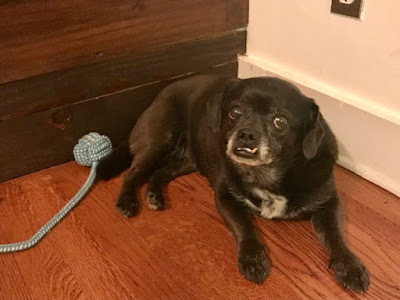 Morty is very sweet, but he still does some bad things, like chewing on things that aren't dog toys. Like this cat tree. Ha! Today was the last race in the Memphis Runners Track Club Winter Off-Road Series — the Shelby Farms 10K. I somehow convinced Paul to sign up last night around 10 pm (ha! ), so he ran this one — the last of four trail races — with me. 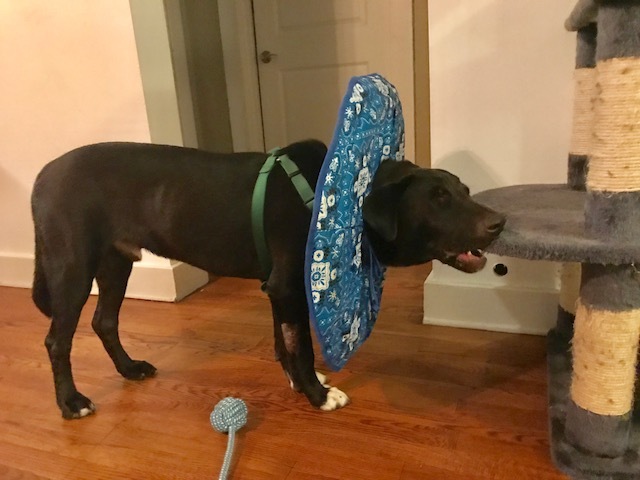 It's a good thing because he's signed up for a half-marathon next weekend, and he hasn't been training much. We started with a four-mile "warm-up" on the Shelby Farms Greenline so I could reach my 10 miles for the day, and then we set off for this very muddy trail race. It's been raining for days, so the trail was a muddy mess. But all of the four races in the series have been pretty muddy, so I'm used to it now! I kind of like getting all dirty in my old running shoes. Anyway, all that is to say that I've been fueling most of my Sunday long runs lately with oatmeal. Sometimes, I just make a bowl using regular old rolled oats and nut butter. 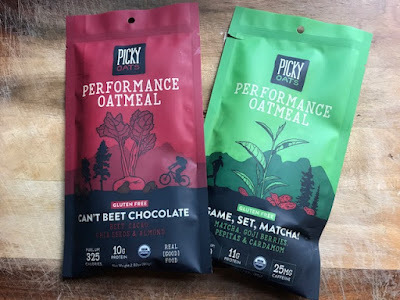 But I recently found these Picky Oats from Picky Bars at Fleet Feet Sports. I LOVE Picky Bars (designed by pro-runner/legend Lauren Fleshman), so I figured I'd love these oats too. And I do! They're designed for performance so they have just the right carb to protein ratio for pre-workout. Of course, I add even more nutrition and staying power with nut butter and fruit. I tried Game, Set, Matcha! Oats first. It has matcha green tea for energy, plus goji berries, pepitas, and cardamom. I topped the bowl with almond butter, hemp hearts, and strawberries. This fueled me through a 12-mile long run a few weeks ago. It kept me full but not too full. There's a sweet spot between full and hungry that I try to reach before my long runs because you don't want a growling tummy or a too-full tummy. 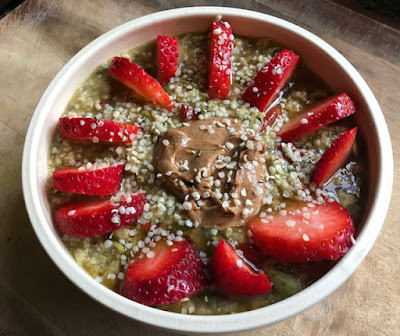 The next week, I had the Can't Beat Chocolate Oats with cacao, beet powder, chia, and almond before my 15-miler. This was a yummy blend that was super-chocolately with a light hint of earthiness from the beet powder (but the beet flavor wasn't overwhelming at all!). 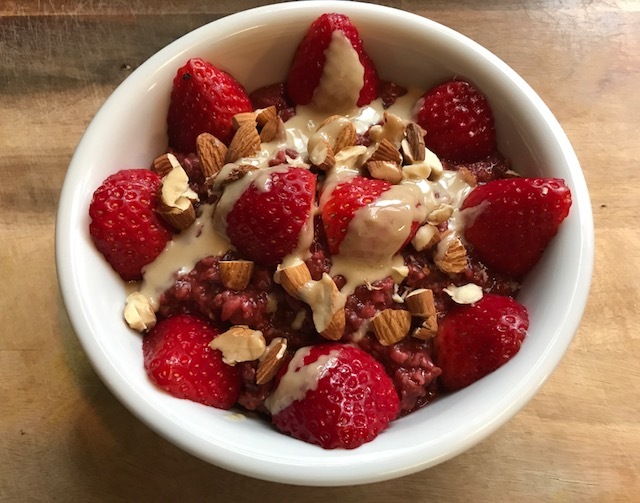 I topped this bowl with chopped almonds, strawberries, and tahini. I wish you could see the oats underneath. They were a lovely shade of red! There's one more flavor — How Bout Dem Apples? — that I didn't see at my running shop, so I may have to order from the Picky Bars website! If you're looking to fuel a long, endurance workout, these Picky Oats are perfect. And the oats are all vegan! Some of the Picky Bars aren't (some contain honey), so be sure to read the labels on those. My partner Paul's brother Donnie and his partner Jackie are involved with a family brewery business in Pennsylvania called Sobel's Obscure Brewery. Jackie's father, along with herself and her brother Gordon, lauched SOB (as its nicknamed) in 2012. 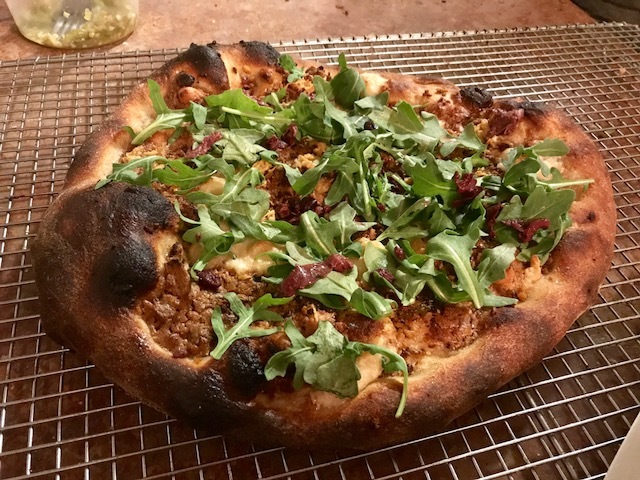 Though we can't buy the brew down here in Memphis (craft beers tend to be regional), Jackie and Donnie brought some down over the holidays and asked if I could create a few vegan recipes with them. I love cooking with beer! It adds such a complex flavor to recipes. Of course, the dish that comes to mind immediately is beer chili. Beer adds a nutty, malty flavor that complements to spiciness of the chili pepper and the heartiness of the beans. I used the SOB Prehistoric Pilsner in this Vegan Beer Chili (recipe below!). It's a light-bodied ale with just a little hint of citrus. There's a slight hops flavor that's balanced and not at all overwhelming. I prefer easy-drinking beers like this in a chili rather than something hoppy like an IPA. If you can't get SOB brew in your area, any great pilsner will work for this recipe. But if you're in the Pennsylvania region (here's the store locator), you should definitely try it! I'll be creating another recipe using their IPA soon. Stay tuned! By the way, Donnie creates the art for the labels. There's a different beer gnome on each varietal. This is Badgertail. Heat the oil in a stock pot. Add the onion and saute 3-5 minutes or until soft. Add the garlic and saute another minute. Add the carrot, bell pepper, and hot pepper, and saute another 5-7 minutes or until veggies start to soften. Add the corn, tomatoes (and the juice), beans, beer, tomato paste, and spices. Bring to a boil. Cover and simmer for 30 minutes. Serve with vegan cheddar, vegan sour cream, tortilla chips, cornbread, crackers, or whatever you fancy on your chili! Also makes great filling for burritos and topping for nachos and fries. I work a full-time job, train for marathons (and now a 50K! ), serve on volunteer boards, and lead a pretty active social life, so I'm a busy lady. But meal time is important to me, so I never skip meals no matter how busy I am. Breakfast, lunch, and dinner are my top three favorite times of the day! I'm all about eating, and I prefer to eat healthy, fresh foods whenever I can. But cooking takes time, and while I manage to find time (thanks meal prep! ), I can still use a short-cut every now and then. That's why I'm super-stoked to discover Straight from the Root — sous vide-style cooked vegetables that are recipe-ready. They sent me some samples of their vegetables to review, and I've been working them into all sorts of fun, quick meals. Sous vide cooking keeps all of the vegetables' vital nutrients intact, unlike traditional cooking methods, such as boiling or steaming, which typically cause nutrient loss of up to 30 percent (according to the Straight from the Root website). Plus, sous vide-style cooking really lends these veggies the perfect texture. To prepare these, simply place the plastic bag into the microwave and heat for 90 seconds. They can also be enjoyed cold, straight out of the bag! By the way, here's the store locator on their site to see if they're available in your area (sadly, they're not in mine YET). Last night, I used the Organic Baby Potatoes to make a Potato Salad. I didn't heat them, just opened the package and dumped them in a bowl with a couple tablespoons of vegan mayo, about a quarter of an onion (minced), one stalk of celery (minced), pickle relish, and a plop of Dijon. Perfect! These had the texture of al dente potatoes, exactly how I like mine for a potato salad. Served with BBQ Tempeh and Roasted Garlic Asparagus. I especially love the Organic Butternut Squash because I DETEST cutting butternut squash. I hate it so much that I rarely ever cook with it, yet I love the flavor and texture. I know you can buy pre-cut squash, but my Kroger rarely carries it, so if I want the pre-cut stuff, I usually have to drive out to Whole Foods. I used the butternut squash in Gena's Black Bean Enchiladas (from Power Plates — see Sunday's review), which were stuffed with kale and butternut squash. Her recipe called for roasting a butternut squash, but I was able to skip that step! WINNING! The Baby Carrots were a lot of fun. I don't typically eat cooked carrots unless they're in a recipe, but after enjoying these, I'm thinking I'll be eating them cooked more often. I love how cooking releases the sweetness of the carrot. Plus, these were so cute with their little tops (which I did not eat, by the way). I enjoyed these as a side dish to a quiche with some hummus for dipping. The Organic Sweet Potatoes made perfect burrito filler! I stuffed some in a burrito with chickpeas, Daiya, baby spinach, and fire-roasted tomatoes — a use-up-what-I-have-in-the-fridge burrito. The Organic Red Beets were really convenient. I love beets, but I don't love getting the red stuff all over my hands, clothes, and cutting board. 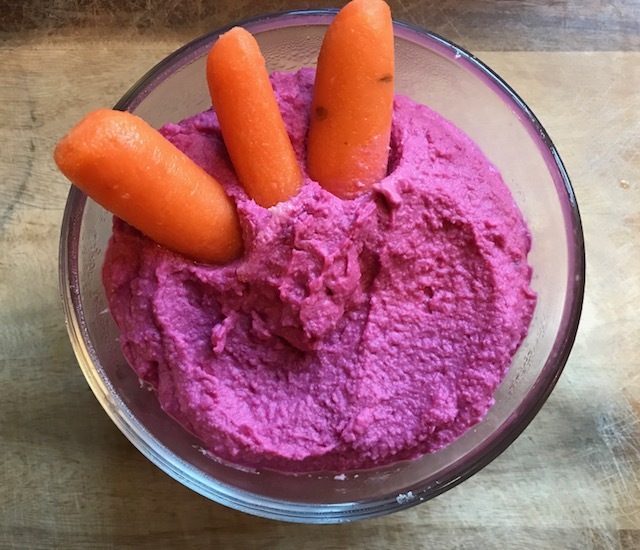 These made a great side dish (Straight from the Root sent me two packages of each, so I've been trying them all kinds of ways), but my favorite use was in this Beet Hummus (recipe below!). I brought this to a full moon gathering, and it was so pretty and delicious. Look at that pink! If you want super-smooth hummus, place the chickpeas in a bowl and use your fingers to pop off the chickpea skins, one by one. Discard the skins. You can skip this step to save time, but your hummus won't be quite as silky smooth (I typically start this process and give up halfway through!). Place the chickpeas and all other ingredients (except the water) into a food processor and process until smooth. Drizzle in the water, using as much as you need to assist the processor in making smooth hummus. Enjoy! Here are a few random things I've been eating! Probably the most exciting meal lately was this awesome Taco Night plate prepared by my awesome dad. Since he's semi-retired, he's started cooking dinner for my mom so it's ready when she gets home from work. My dad was never a cook before, so this is all new, and he's really got some serious talent that we didn't know was there. He made Vegan Tacos with seasoned Gardein beef, Daiya, and all the fixins. 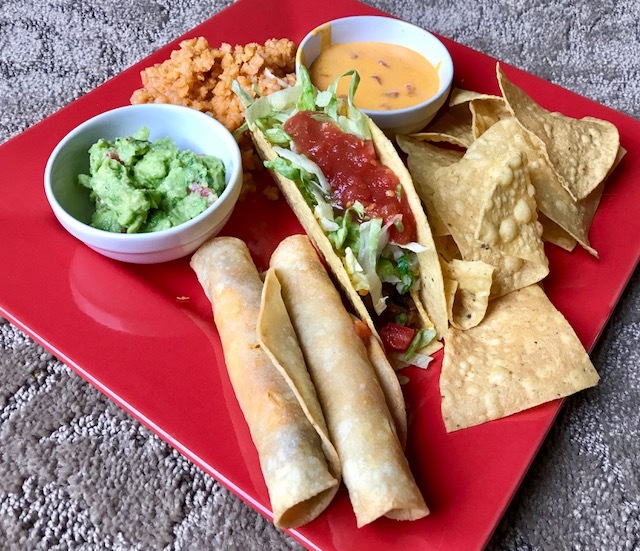 Plus, he made some special-recipe Air Fryer Vegan Taquitos! He made me a bunch to stash in my freezer, but I accidentally drove off and left them at my parents' house. So sad! I'll have to go back and visit soon and pick them up! By the way, I plan to get his recipe for the taquitos soon, and I'll share! 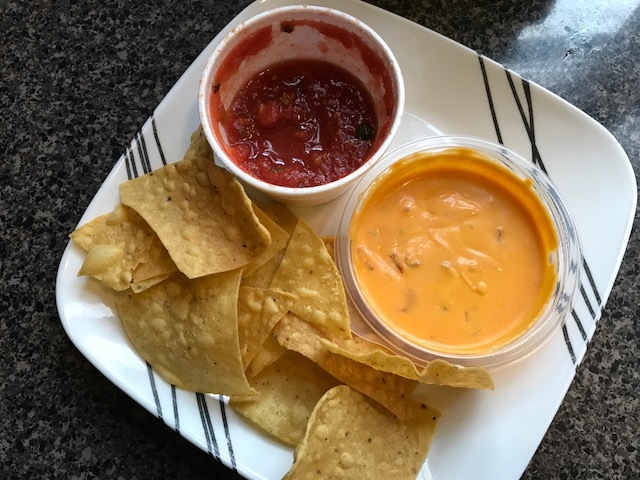 Also, for that dinner, my mom made Vegan Queso using the new Daiya cheeze sauce with canned Rotel, plus some awesome homemade guac. And she ordered takeout chips and salsa from their neighborhood Mexican restaurant. Oh, and mama made Spanish Rice too. I got several great meals out of the leftovers. I made burritos for a couple days with the leftover beef and Daiya. And the queso and salsa made the perfect Saturday afternoon "cleaning the house" snack. I have to snack when I'm cleaning. It's the only way to clean, y'all. You just get a bite or two after each room. Food is an excellent motivator. Speaking of snacks, here's the last ever Cashew Cheddar & Carrot Bacon Bun from Lulu's Baked. Don held his last Saturday market a couple weeks ago. So sad to see him go! But he's moving on to awesome-r things that will do more to improve vegan options in Memphis, so stay tuned! More on that soon! 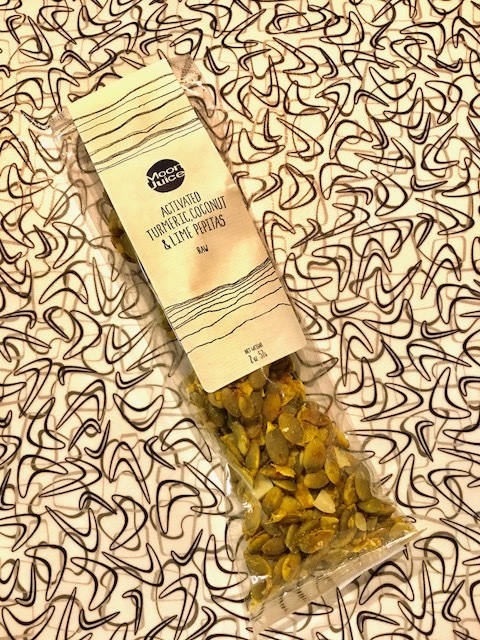 Here's another fun snack — Activated Turmeric, Coconut, & Lime Pepitas from Moon Juice. I scored these at Delta Groove Yoga. They sells lots of Moon Juice stuff! I was weirdly craving Buckwheat Pancakes and Vegan Sausage Friday night, so I decided I'd have that as my pre-bootcamp breakfast on Saturday morning. Luckily, I had Arrowhead Mills Buckwheat Pancake Mix in the pantry and Field Roast Apple-Maple Sausages in the deep freezer. Sometimes, it pays to be a food hoarder. 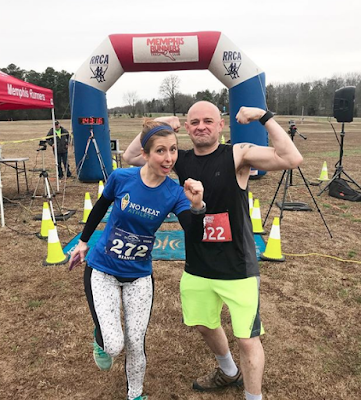 I had my third trail race on Sunday — the Stanky Creek 8K (plus an extra 3-mile training run on my own to get in my 8-mile long run for the day). 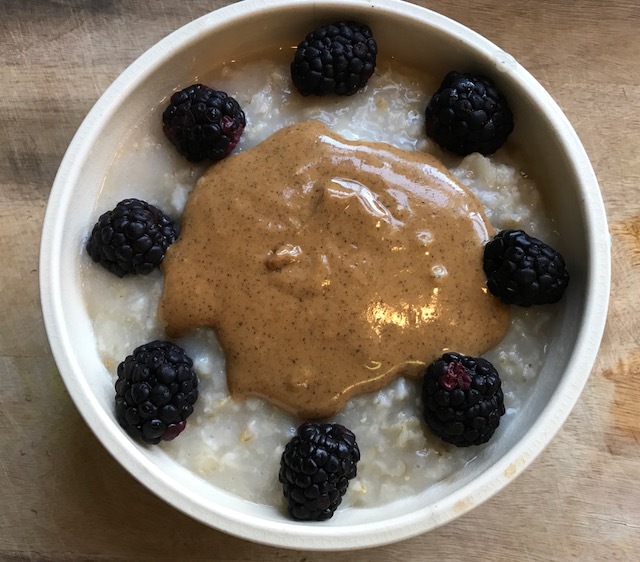 Before the event, I had some Oatmeal with Sugar Cookie Peanut Butter, Maple Syrup, & Blackberries. The peanut butter was by Wild Friends, and I found it on sale at Natural Grocers in Jonesboro. Also, guess what? 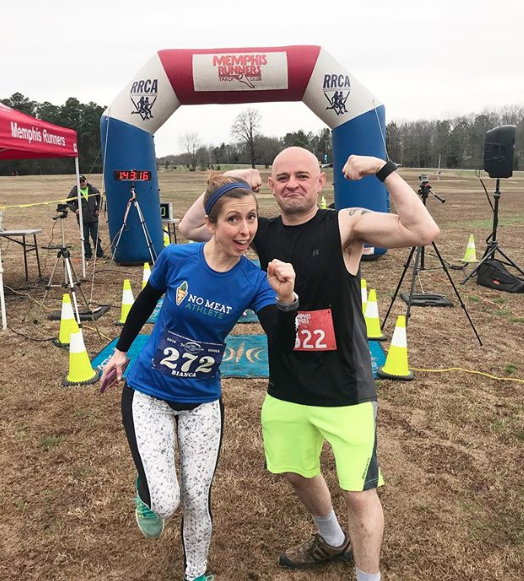 I loved the 8K so much that I signed up for the Stanky Creek 50K (in September) later that night!!! It'll be my first 50K (that's about 31 miles), so I'm pretty excited and also nervous. Here's Monday's breakfast — Gena's Savory Oats with Tempeh Sausage and Everything Hummus. I just discovered Sprouts Everything Hummus, and it's the greatest thing ever. It's like an everything bagel, but it's hummus. I can't wait to try it on an everything bagel with TJ's bagel seasoning and have my MIND BLOWN. And finally, here's an awesome fried tofu plate from Pho Binh. I met my old co-workers Susan, Toby, and Justin there for lunch last Thursday. All of this awesomeness is from their buffet — lemongrass tofu, green bean tofu, and tofu veggie stir-fry, plus cabbage soup! It's time for my monthly "unpacking my Goddess Provisions box" post! Every month, I share what's inside my subscription box, usually a collection of crystals, candles, chocolates, teas, and beauty products. The February box theme was Faerie Magick! But we should back up a little before we talk about what's in the box. We should back WAY up to high school/early college. It was the late 90s, and I was super into faeries. I even got a tattoo of a faerie — my first tattoo — in 1999 (or was it 1998?). The design came from a Brain Froud book. I was way, way into Froud back then (and still am!). I had faerie knick-knacks and art pieces all over my apartments, and a few of those have survived the years and still decorate my home today. So I was super-stoked over this theme! Brought me back, y'all. Here's what was inside. There's a Cottagewicks Candle with strawberry quartz and turquenite. It's scented with lavender essential oil. I'm really excited about the turquenite since I don't have this crystal in my collection already. Once the candle burns down, I'll save it! 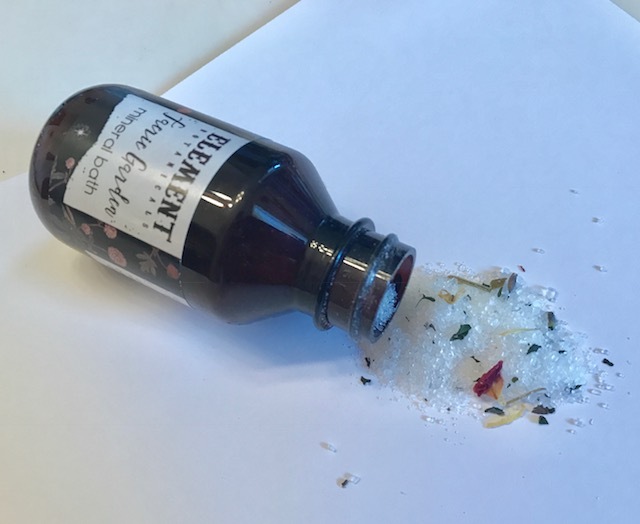 The candle goes well with the Element Botanicals bath salts with rosewood and lavender essential oils. I've been enjoying relaxing baths with these! My favorite item was this Pacifica Liquid Highlighter. I've been applying this glittery, crystal makeup to my cheekbones for a fun glow. 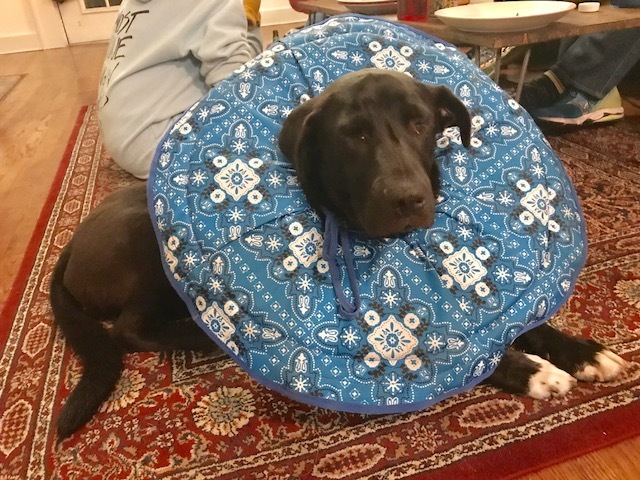 Maynard thought the Biolumenessence Flower Essence was a treat for him. But nope, it's a treat for me. A few drops of this essence on the tongue helps you align yourself with nature spirits. I definitely feel uplifted when I take it. It's amazing the power of essences and tinctures. The Superfeast Mushroom blend is a powdered mix of eight medicinal mushrooms. On its own, it's very bitter, so I don't recommend mixing with straight water. But the flavor is completely masked when it's added to a smoothie. The crystal this month was rose quartz, and they accidentally sent me two! I didn't take any pics of these by themselves, but you can see them in the picture above. Just little pocket crystals. Nice for carrying around and great for crystal grids. And here's my second favorite item! 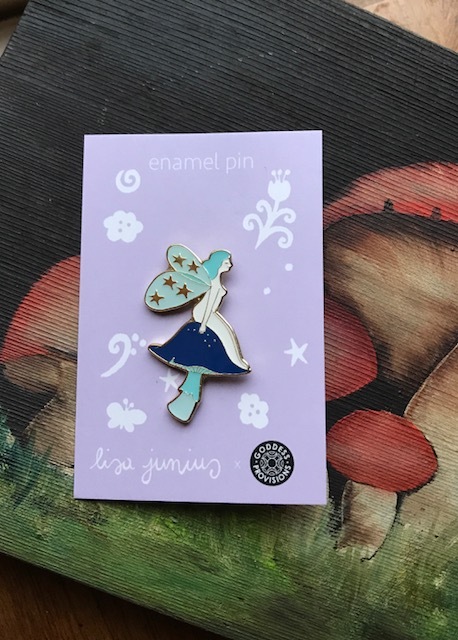 The Lisa Junius faerie pin! 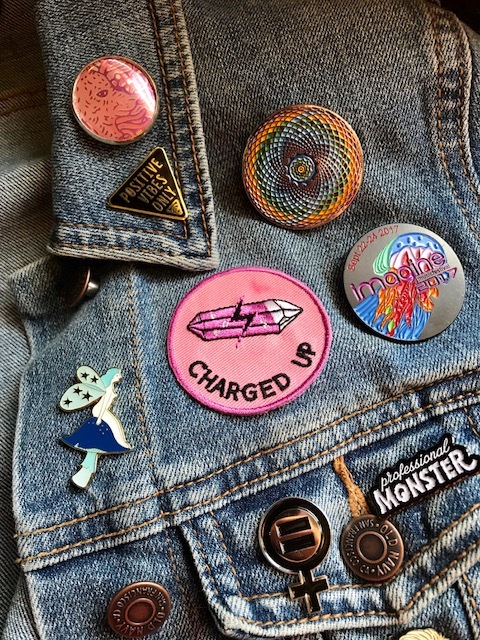 I've got the quite the pin and patch collection going on my jean jacket (mostly thanks to Goddess Provisions boxes), and this one is a perfect addition. By the way, I'm a Goddess Provisions ambassador, which means I make a couple bucks if anyone signs up using this link. I don't get my boxes free though, just to be clear. I subscribe and pay the $33 a month, and it's totally worth it. It's a great deal, and the boxes are so much fun! The Month of Nailing Breakfast! The Impossible Burger Comes to Memphis! New Ben & Jerry's Vegan Flavors!